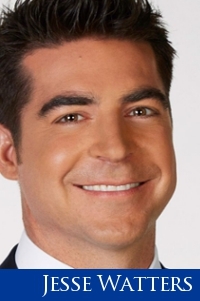 Jesse Watters currently serves as the host of Watters' World (Saturdays, 8 PM/ET) and co-host of The Five (weekdays, 5-6 PM/ET) on FOX News Channel (FNC). He joined the network in 2002 as a production assistant. On Watters' World, Jesse takes on compelling guests and top news makers with his original style and fun personality. Recently in March 2017, he aired an exclusive interview with President Donald Trump aboard Air Force One. On The Five, Jesse is part of a round-table ensemble of FNC personalities who discuss, debate and even debunk the hot news stories, controversies and issues of the day. In 2003, Jesse made his on-camera debut as a correspondent for The O'Reilly Factor. While working with the program, he showcased his popular man-on-the-street interviews, traveling to different locations while quizzing individuals about politics, pop culture, and current events. Jesse graduated from Trinity College with a Bachelor of Arts in history.